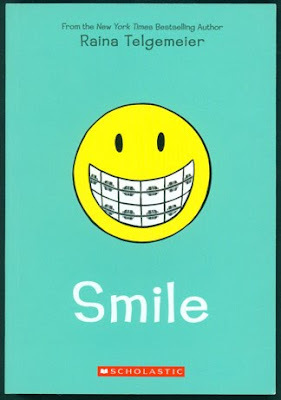 Raina's graphic novel Smile, a memoir of her middle-school experience with some nasty dental problems that compounded the usual social dramas of adolescence, has been well-reviewed and picked up by Scholastic, which sold it to school kids throughout the country. As mentioned in today's interview, she has also done comics adaptations of Ann M. Martin's Baby-Sitters Club series and co-wrote the manga-style X-Men: Misfits. We did not mention that she also contributed a story to Volume 4 of the popular anthology series Flight. My question about ink was meant to be kind of funny-stupid, but I think led to an interesting answer. Raina says she once tried to use the same ink I use and hated it. I had a similar experience with paper, when I changed brands and thought I'd lost the ability to draw. Turned out I just couldn't draw well on that paper--its texture did bad things to my ink line. Cartoonists say that one of the most common questions they get is "What kind of pen/paper/ink/brush/computer program do you use?" The easy answer is that it doesn't matter: a cartoonist can work with expensive, exotic materials or ballpoint pens on cheap printer paper. But I think a better answer is to try a bunch of different stuff and learn what you like. Materials and media that one cartoonist loves may not work for you at all, and vice versa. Tomorrow: a Two-Minute Interview with a total stranger.